Who wins? The "Geek Squad" at Best Buy... or the little guy? When your computer isn't working, one of the first thoughts most people have is that it's time to get some service on it, probably from a local computer repair place. However, with so many options, how do you make up your mind? Do you choose a local "Mom & Pop" computer shop downtown or do you visit a well known, national chain PC repair service like Geek Squad/Best Buy (US/UK/Canada)? Before contacting any computer repair service, we highly recommend that you read through some of these resources we've put together. If you're sure that this problem is one that you can't fix yourself, or you've given it your best effort and it's time to call in the pros, the tips below should help you make the best decision on a particular service. The very best chance you have of choosing a great local computer repair service is if you're referred to one. If several people had a fantastic experience with one particular repair service, the chance of you receiving similar service is likely very good. Personal referrals are great but it's unlikely that you would get enough by chance encounter to feel confident about the value of a particular service. We highly recommend searching online for a local computer repair service. Many have reviews on various services that should make your decision making easier. Yelp is a great example of a helpful service for this, as is the local business information on Google Maps. A flier is not a referral, a web advertisement is not a referral, a full-page ad in the Sunday newspaper is not a referral. Over time, you learn to think of these advertisements as the knowledge you have about the value of the specific company, but the fact remains that you only know what they've told you. A company can advertise all they want but the message will always be biased! Obviously, the message might be completely honest and a particular computer repair services might very well be the best in town, but you can't know that from an ad, big or small. It seems more than logical to anyone reading this, I'm sure, but don't get service anywhere that you've ever had a poor experience at. There are always other options. Yes... you should spy. Spy your heart out. Few computer repair services rely completely on their service business. Almost all of them also have at least a small retail area at their place of business and, of course, the national chain services are usually attached to large retail outlets. Visit their store, browse a bit, but pay close attention to other customers who are dropping off or picking up their PCs. Do they seem satisfied? Make sure you observe as many customers as you can. Try to be as scientific as you can about your little survey. Observe the computer repair technicians — do they seem knowledgeable, professional, and helpful? They should. Go elsewhere if not. Did you think that your only option for computer repair was the big retailer in the shopping center? Do you avoid national chain repair services simply because they're big? Do you assume that the "Mom & Pop" shop is more expensive than Geek Squad? Or vice versa? Usually, the computer repair service with the very best value deserves your business and the business of the people you know, no matter the size of the building or the size of the advertising budget. 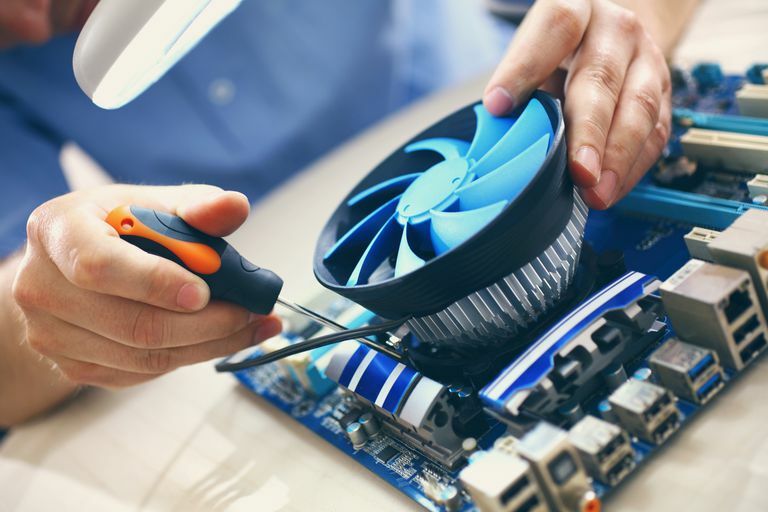 Once you've decided on a company to go with, we highly recommend that you read through several questions that you should always ask computer repair professionals, as well as the answers a really good service should reply with. We also highly recommend that you know how to describe your problem to a computer repair professional. Even the very best computer service outfit on the planet will have difficulty solving your problem if you don't give them a good place to start. Finally, frequently asked questions about computer repair might answer any lingering questions you have about paying to get your computer repaired.